Today I am going to share very Important code for countdown watch in Android. For this I am using Handler Thread. Hope it will help you guys. Just copy paste below code and enjoy. textTimer.setText("" + minutes + ":"
+ String.format("%02d", seconds) + ":"
Thanks ak for your valuable comment..
@venkateswara what you mean by-"pushnotification in setting" . please see below url for push notification demo. And what about if you want to stop the countdown when it reaches an specified time? how do you do it? But I would like to know if there is anyway to pause a progressBar when pause button is clicked and resume it again after play is clicked. Please help if you have any idea. Please check my blog for custom progress bar..
1)take a initial value like 3 min. 2)run my code but don't display count-up just calculate 3 minute. and then stop that timer. How to stop timer ? just stop the thread. and get final value. Okay I will response on your question. how to take the incoming notification time and store it in some activity .? Great tutorial. It works all fine.To your example I added one more EditText. But when I click on the edittext, the timer is not getting updated in the textview also if I type something in the edittext, its not getting updated.Seems like the UI is halt.Please help me. you want timer value in textview? it is already in a textview. and at the time of typeing in edit-text why it got halt..
Do one check please before start timer try to type and let me know its halt or not? if no that mean it is thread issue. 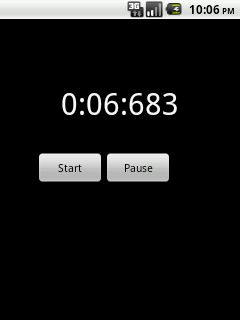 I want to restart the timer by clicking the next point on image...and i want to store the counter time.. When i copied your code and run it here on my laptop, it says "force close". why is it? Can you help me with this? hoping for your fast reply. hi..when a user presses a button an alert dialog appears and the app should close in some 10 seconds and i need show the remaining time in the alertdialog something like " App will be closed in 10..9..8.....0 seconds" how can i show remaining time in the alert dialog..any help will be helpfull.. I want to save time to shared preferences and load it when app started again.,please help! ? It is stopped when i close activity so how can i run always in background until timer finish.